Begin your Best of the Garden Route Self-drive Spectacular with four memorable nights at the Dock House Boutique Hotel and Spa in Cape Town, which is regarded as ‘the jewel in the crown’ of the glamorous Victoria & Alfred Waterfront. From Cape Town, you’ll head towards Montagu where you will spend three truly remarkable nights at Dywka Tented Lodge in one of the nine luxury tents, complete with private decks and heated jacuzzis. From a dry Karoo ravine to a secluded valley, the next leg of the self-drive journey sees you arrive at Madi Madi Karoo Safari Lodge, near Oudshoorn, for three nights. After experiencing, first-hand, the idyllic blend of luxury and tranquillity that Madi Madi has to offer, your uniquely African experience continues with a three-night stay in Plettenberg Bay at Tsala Treetop Lodge. Set amid the treetops of an age-old indigenous forest, Tsala is a lavish celebration of the spirit of Africa. The penultimate stop on this self-drive spectacular is one night at Port Elizabeth’s 5-star No 5 by Mantis Hotel. Nestled in an upmarket beach suburb, this luxury boutique hotel is within 100m of the Indian Ocean and each of the ten exquisite suites are masterpieces of comfort and opulence. From Port Elizabeth you will embark on the final road trip of this adventure, a scenic drive to Port Alfred where the Oceana Beach and Wildlife Reserve promises to make the final three nights unforgettable. Offering a luxurious boutique hotel experience in a wildlife reserve on the Indian Ocean, Oceana is exclusive, yet unpretentious, offering guests a relaxing environment in which to unwind and celebrate the finer things in life. A fitting end to a 23-day celebration of the best that the Garden Route has to offer. Arrive at Cape Town International, collect your hired car and take a short drive to the Dock House Boutique Hotel and Spa in the beautiful V&A Waterfront, where you will spend the next 4 nights in pure luxury. Originally built as the Harbour Master’s private residence in the 1800’s, this grand architectural gem has been transformed into one of Cape Town’s most exclusive and elegant boutique hotels. Dock House is a unique and opulent jewel in the crown of Cape Town’s glamorous, world-famous Victoria & Alfred Waterfront, offering guests exclusive accommodation and personalised yet unobtrusive butler-style service in an excellent world-class setting. The glamorous suite plus each of the five chic rooms at Dock House Boutique Hotel & Spa has been individually decorated and imbued with a unique and understated Victorian elegance, juxtaposed with lush contemporary style and comfort. Urban Beauty Spa offers guests sophisticated cutting-edge gym facilities with panoramic harbour and mountain vistas, as well as secluded treatment rooms for personalised pampering. From the very first moment of arrival at Dock House Boutique Hotel & Spa guests can expect minute attention to detail, exclusivity and personalised yet unobtrusive butler-style service. A cable car ride up Table Mountain and a visit to Cape Point is an absolute must whilst exploring the Peninsula, so take great care of including them in your plans. Pre-planning of your time here will be worthwhile as there are many excellent hikes, wine farms, galleries, museums, shops, restaurants and events in Cape Town to experience and discover. Magnificent views, panoramic landscapes and towering cliffs, streams and the abundance of trees and indigenous flora, all contribute to making the Breede River Valley one of the Western Cape’s most diverse regions. An approximate 3 and a half hour drive will bring you to the breathtakingly beautiful Sanbona Dwyka Tented Lodge, where you will spend the next three nights. The malaria-free Sanbona Wildlife Reserve is around a three-hour scenic drive from Cape Town in the heart of the Little Karoo, along Route 62 – the world’s longest wine route. At the foot of the towering Waterberg Mountains, Sanbona boasts 58, 000 hectares of sculpted Cape Fold Mountains, wide-open Karoo plains, indigenous flora and fauna and rare examples of San rock art, some dating back more than 3, 500 years, plus a unique boat safari. More than a Big 5 wilderness reserve, it’s the vastness of the landscape, the alluring stillness and isolation amid the raw beauty and boundless plains that make Sanbona unique. Surrounded by towering mountains and open plains it boasts an impressive selection of succulents and wildlife, including the Big Five and free-roaming white lions. 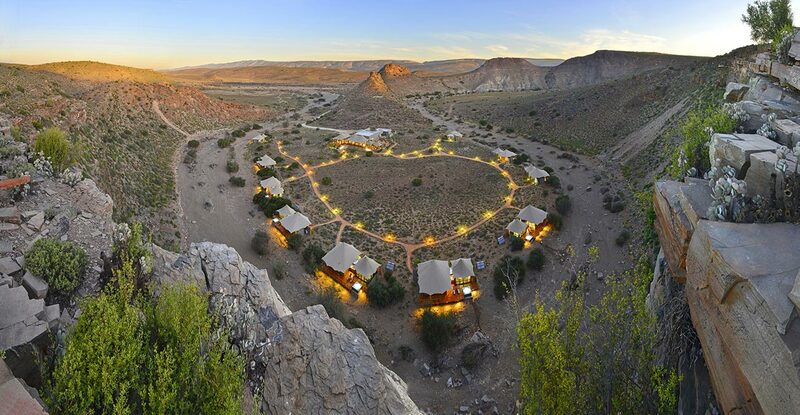 Sanbona offers five-star accommodation at three luxurious lodges. An incredibly scenic drive along the famous Route 62 of approximately 3 Hours will bring you to your destination for the next two nights, the magnificent Madi Madi Karoo Safari Lodge. Once in a lifetime, you find a special place suspended in time, hidden in a secluded valley in one of the most ancient and remote corners of the world. Madi-Madi Karoo Safari Lodge. The Karoo Game Reserve offers guests an experience of ultimate luxury accommodation in the Karoo, personalized service, exquisite nature and wildlife including, Cape Buffalo, Giraffe, Wildebeest, Zebra, Eland, Springbok and over 200 bird species. They also offer Bush Drives (Game Drives), Horseback Safaris, Birding, Nature Walks, Sunset River Cruises, Stargazing evenings and much more. The Madi-Madi Karoo Safari Lodge provides unique Luxury Little Karoo Accommodation that is close to the neighbouring towns of Dysseldorp and Oudtshoorn. Accommodation Guests have an amazing selection of 2 Executive Riverfront Cottages, 2 Luxury Suites and 2 Superior Riverfront Cottages, all with amazing 180-degree views of the Kammanassie River. Madi, the Venda name for water, is situated just off the famous Route 62 (R62) in the forgotten secluded valley in the Little Karoo, one of the most biodiverse regions of South Africa and nestles between the Swartberg Mountains and the mighty Outeniqua mountains just outside Oudtshoorn. After a magical stay at Madi Madi Karoo Safari Lodge, an approximate one and a half hours drive will bring you to your home for the next three nights. The breathtakingly beautiful Views Boutique Hotel and Spa. Tsala Treetop Lodge is a mere one hour drive from Views Boutique Hotel, this spectacular lodge will be your home for the next three nights. Whether you wish to stay in and relax amidst the ancient enchanting forest, or to head out and explore South Africa’s celebrated Garden Route, experiencing Tsala is pure magic. After a magical stay at Tsala Tree Top Lodge, an approximate two and a half hours drive will bring you to the elegant No5 by Mantis Hotel, situated in Port Elizabeth where you will spend the night. An hour and 40 minutes’ drive will bring you to the magnificent and charming Gorah Elephant Camp, situated in the Addo National Park, your home for the next two nights. The thrill of quietly watching a herd of elephants stroll by while sipping tea on the veranda of a stately colonial manor house is the unforgettable stuff of dreams. This exclusive lodge recaptures the romantic mystique of authentic safaris from centuries past. Experience the breathtaking natural world of Africa merged with colonial nostalgia and modern sophistication, to deliver an unforgettably unique 5-star adventure. Gorah is the only private concession and Camp situated in the middle of the famous Addo Elephant National Park, home to the densest population of elephants on earth. Gorah is malaria-free and has the Big 5. During the colonial era, the vast expanses of land, wild animals and fascinating encounters with rural tribes, led to legendary tales of Africa that have shaped history and drawn more and more visitors to this magical and mystical place. To experience Gorah is to get a taste of this history. Discover its captivating rhythm that calls for adventure and fills your soul with an intense passion for the ever-changing landscape, the majestic animals and the cultural diversity. The 1900’s was a time when the elite indulged in the extravagance of crystal, polished silver, white linen and G&T’s in the afternoon. At Gorah, guests are transported back to this era through the day-to-day luxuries offered at the Camp. You will end your once in a lifetime holiday off on a high note, by spending the last three nights at the magnificent Oceana Beach & Wildlife Reserve, a two hours’ drive from Gorah Elephant Camp. Set in a spectacular and unique environment, Oceana offers a truly special luxury boutique experience. The property is perfectly positioned within a sprawling wildlife sanctuary, fronted by a pristine 7km stretch of private beach. With absolutely everything is taken care of by their discreet staff, this private and intimate destination is where guests go for a “holiday whilst on holiday”. After breakfast, an hour and 50-minute drive will bring you to Port Elizabeth International Airport from where you will start your journey home after a holiday of a lifetime.